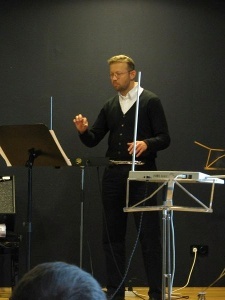 Jason started Theremin World as "The Theremin Home Page" in 1996 when he was a graduate student at Vanderbilt University. His obsession with theremins started when he first saw one in person during a Pere Ubu concert that year. He began collecting theremin information and schematics and created the original site to share his collection with the Internet. One thing lead to another, and Theremin World was born. In addition to being a theremin and synthesizer junkie, Jason enjoys spending time with his wife and 4 children and working as a Software QA Manager at Amazon. Our New York based editor John is our pipeline to the world of theremin performance and art. In addition to writing for Theremin World, John offers lessons to new thereminists and is a regular performer in New York and New Jersey. Learn more about John at http://www.hoge-theremin.com/. Our Technical Editor Thierry is a world-reknowned "theremingenieur". His services include theremin repairs and customizations, and he is the creator of several innovative modifications for popular theremin models. Get to know him better at http://theremin.tfrenkel.com/.